Before your round, sign in at the pro shop and browse through our great selection of clubs, apparel and golf accessories. We don’t have something your looking for? Contact a member of our staff to help you get exactly what you need to improve your game. Cove View offers a driving range and a putting green. The driving range is great to improve your swing as the putting green will help you make more putts and improve your short game. Coming spring 2017: A brand new putting green with a greenside bunker to practice your shots out of the sand. Target greens on the driving will be added as well to give you the a flag to aim at while hitting the range. 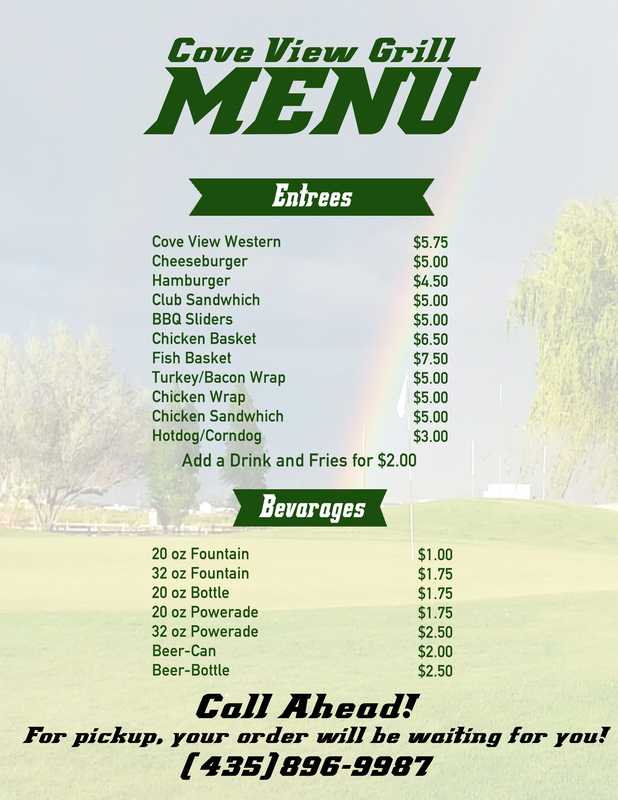 Eat before, after or during your round at the Cove View Grill. From our delicious wraps to our amazing hamburgers, Cove View has a variety of different foods to try. We have both indoor and outdoor seating. We also have a television so you can catch up on your golf mid round. Call ahead and have your meal waiting for you.